Sovereign-Star Racing’s Pro Stock Motorcycle racer Michael Ray brought home his second win of the season and the third of his career after facing his previous crew chief, Matt Smith, in the final round of the O’Reilly Auto Parts Route 66 NHRA Nationals in Chicago, Ill., this past weekend. “It was a huge win for our team! It was a big uphill battle for us this weekend, especially changing both engines late Saturday night. It was definitely a well-earned victory and was also great timing since S&S Cycle celebrated their 55th anniversary recently,” Ray said. As the second win for the 2012 and 2013 Sovereign-Star Racing combination, this victory also marked the 80th NHRA national event win for Star Racing after 33 years in the sport with 10 different winning drivers. “I was happy to get the 80th Wally for Star Racing and the second for our great Sovereign Racing sponsor, Jenõ Rujp. After struggling last year to get the Sovereign-Star Racing combination established, it’s almost a weird feeling being able to win just by putting a good tuneup in the bikes and eliminating the little mistakes. At this point, our team has a great combination of horsepower, ability and opportunity,” Star Racing owner George Bryce said. Following their No. 1 qualifying position at the previous event in Epping, N.H., the S&S Cycle-powered Sovereign-Star Racing team continued to post competitive numbers this weekend in Chicago. Ray’s fellow teammate Scotty Pollacheck held the No. 1 qualifying position until the final round of qualifying when he had engine problems. Pollacheck’s 6.929-second ET was still good enough to keep him in the No. 2 position going into Sunday’s eliminations, with Ray as the No. 10 qualifier. “It was good to see the bike making some good, fast laps. That was disheartening that we broke an engine on the last session, especially after just getting back on the right track. After we put a new engine in for Sunday, it was nice to see it come out first round and run really well, though. That was definitely a step in the right direction,” Pollacheck said. The team made the decision to swap engines in both motorcycles after the final round of qualifying, since the one in Ray’s bike had not shown the results they wanted and Pollacheck’s had been damaged during his last run on Saturday. Although it is not ideal for teams to try out a new engine during Sunday’s elimination rounds, the Sovereign-Star Racing crew was extremely happy with the results of their efforts. During round one eliminations against Andrew Hines’ red light and 7.032 pass, Pollacheck took the win and posted the second lowest ET of the round with his 6.935-second run. Ray also posted the third lowest ET of the round with his 6.945 pass to take the win against John Hall’s 6.999. The Sovereign-Star Racing teammates advanced to round two, where they were scheduled to go head-to-head against each other. “Scotty and Michael went really fast first round with both new engines, so we just gave them a little tuneup for second round to let them duke it out and see who was faster. It was going to be a battle between two very determined individuals with two very fast motorcycles, and our guys were perfectly OK with whoever came out on top,” Bryce said. Unfortunately, a loose oil line on Pollacheck’s motorcycle during the burnout prevented this Sovereign-Star Racing battle from happening. Ray went on to take the solo win with his 6.954/192 mph run, posting the second lowest ET of the round and a quick enough time to get lane choice over Hector Arana Sr. in the semifinals. “I wanted to see the potential of the machines and the drivers and the epic battle of who’s going to leave first and shift on time, but it was disappointing that we didn’t get to see that battle. I was really sorry that Scotty wasn’t able to get a shot at it, but he’s a real trooper. He just said that it was nobody’s fault, and we’ll do better next weekend,” Bryce said. In the semifinals, Arana’s small advantage off the starting line was not enough as Ray caught up and then pulled away to take the win with a 6.971/192 mph pass against Arana’s 7.013/190 mph run. Ray’s pass was also the low ET and high mile per hour for this round. During the final round against No. 1 qualifier Matt Smith, Ray had a nearly perfect .008-second light to give him the lead right away and then pulled away from Smith for the rest of the run. Ray posted a 6.986/191 mph pass to win the event against Smith’s 6.992/190 mph run. “It was nice to face my old crew chief in the final and to leave on him and outrun him. It kind of solidified my decision over the winter to change teams, since I knew this would be my best opportunity to win a championship. There are no hard feelings, but it’s still a good, competitive rivalry,” Ray said. 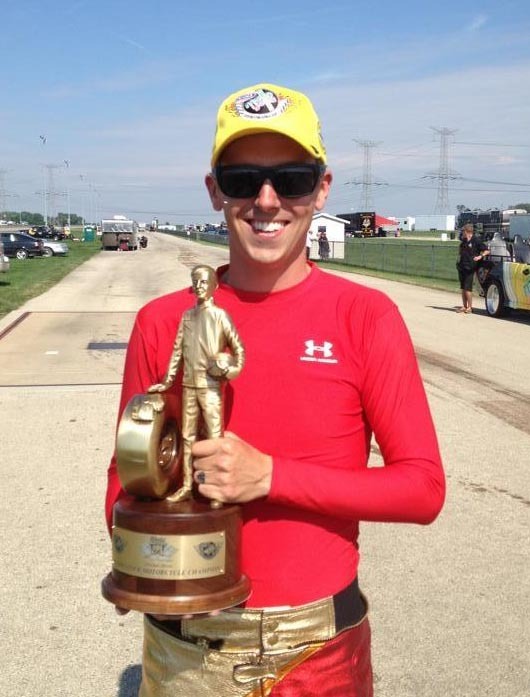 In spite of the team celebration from winning another coveted Wally trophy, Pollacheck was also racing with a heavy heart over the weekend as he learned that Billy Hammon, a very close friend, employee and fellow racer of Pollacheck’s, had been killed in an accident. After hearing this news on Saturday, Pollacheck’s desire to claim a win became even stronger in order to honor his late friend. “Our thoughts and prayers are with Scotty and the entire Quality Tire family. We love them and are thinking about them. I’d be scared to race that guy next weekend; he’s going to be full of fire and emotion. I really think next weekend will be his weekend to win,” Ray said. Teammates No. 2 Ray and No. 6 Pollacheck remain in the top 10 points standings for the NHRA Pro Stock Motorcycle Mello Yello Series following their performances at the Route 66 NHRA Nationals. The Sovereign-Star Racing teammates will compete this coming weekend, July 5-7, at the Summit Racing Equipment NHRA Nationals at Summit Motorsports Park in Norwalk, Ohio. The 2013 Sovereign-Star Racing Team is a partnership between Georgia-based Star Racing and the Hungarian-based Sovereign Racing Team, the 2011 UEM European Pro Stock Bike Championship Team, owned by sugar distributor Jenõ Rujp. The Sovereign-Star Racing Team would like to thank the following sponsors: Sovereign, Star Racing, Americus Motorsports Complex, S&S Cycle, Daytona Sensors, Worldwide Bearings, CP Pistons, Cometic Gaskets, Quality Tire, and Uncle Hal Gottspeed Racing.